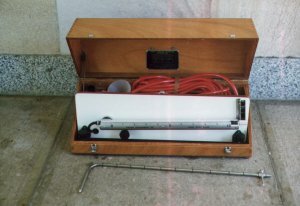 Portable airflow kit, includes manometer (small air flow anemometer), pitot tube, thermometer, adjustable metal ruler scale for varying inclinations of pressure tube,, adjustable leveling screws, g-clamp hole in back of case though g-clamp is missing, paraffin refill bottle (empty), pouring funnel for paraffin, appropriate tubing and operation manual all kept in small portable polished wood case. This airflow kit was designed to measure flows of small size. It was designed for use in the field (this one was probably used in the vet school to monitor ventilation for farm animals), given that it has four inclinations for different scales, g-clamp support and two inbuilt sprit levels. 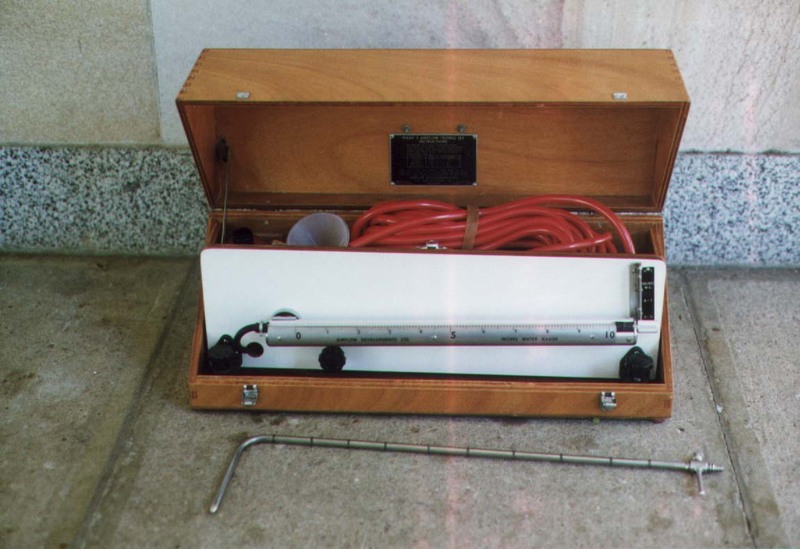 The manometer has four operating modes: positive air pressure, negative and differential with both pitot tube and orifice plate (orifice plate not included). The manometer used dyed paraffin with a specific gravity 0.787 at 60 degrees F as the working liquid. The manometer must be made level in horizontal mode before use. This can be done with two adjustable knobs under the manometer limb. The pressure level can be calibrated by adjusting the knob on the front panel. The gauge measures in 'inches water gauge'.